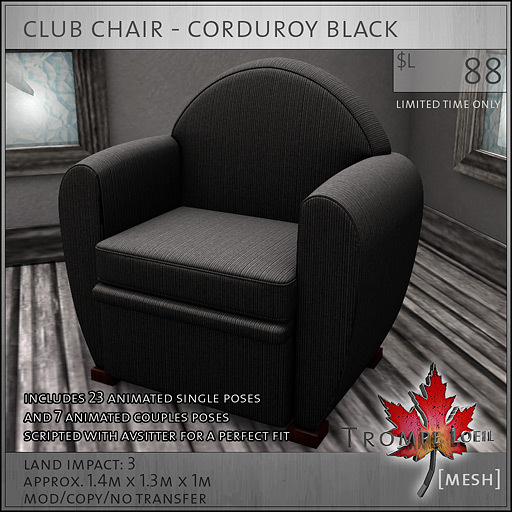 Collabor88 December is here! For the last session of 2012 we have a huge selection of cozy mesh prefab cottages, loveseats and club chairs to curl up with – all you need to add is your holiday cheer! First up, our latest mesh prefab – the Frostbite Cottage! Available in white, blue, rose, or gray, this winterized wonderland includes a home control center (in a festive snowflake), lockable doors with access list, iced or clear windows on touch, a roaring fire in the fireplace that you can turn on or off (including the smoke from the chimney), and its all packed in a handy self-installer box for easy setup. 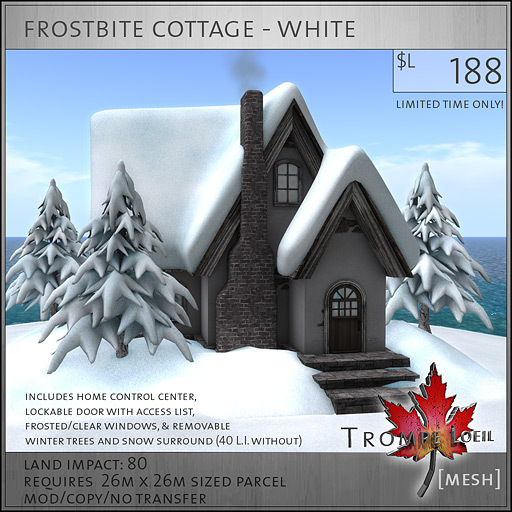 Once the season is over, you can remove the winter snow mesh and trees for a perfectly-baked snowless cottage for spring, summer and fall! 80 prims as shown and only 40 prims with the winter mesh and trees removed, this is a fantastic bargain and works great as a second getaway, vacation home, kid’s playhouse or rental! 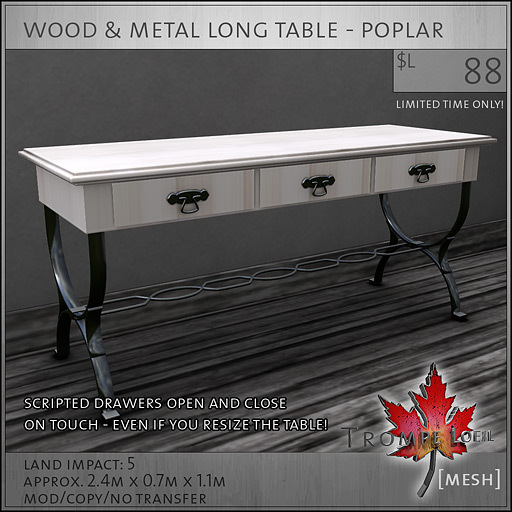 Swing into Collabor88 to check out the mini display or the full sized demo home (teleport sign at the mini display). 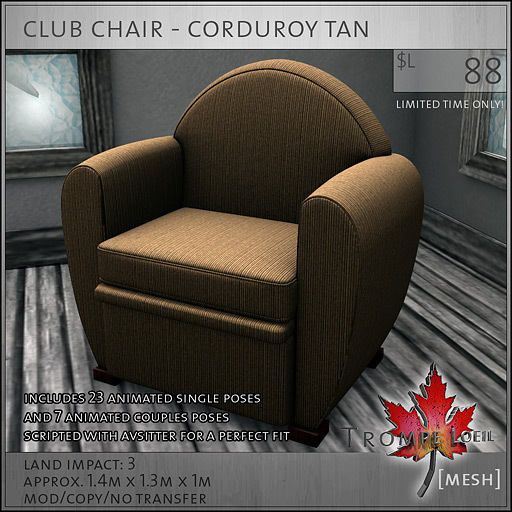 Need something to curl up on inside your new cottage? 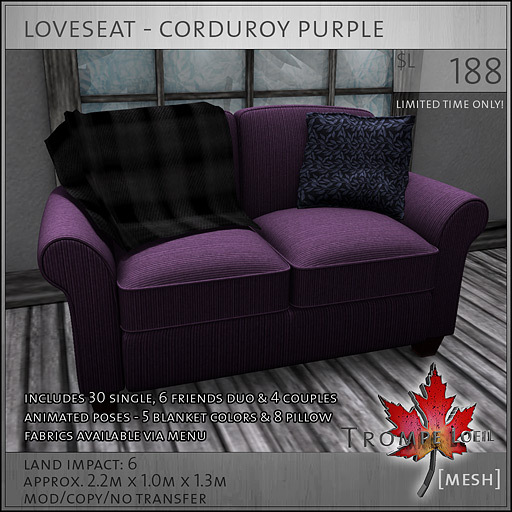 Grab our Loveseat and Club Chair in cozy warm corduroy fabrics! 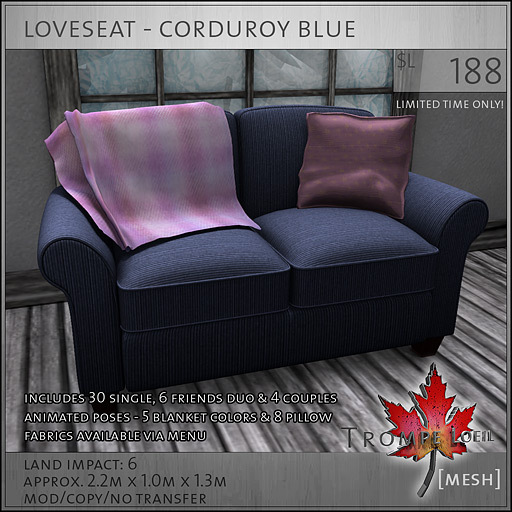 Pick from 6 corduroy colors, and indulge in tons of animations (30 in the Club Chair for singles and couples, 40 in the Loveseat for singles, friends and couples). Plus, the Loveseat features 5 blanket colors and 8 pillow fabrics available via owner-only menu! Mix and match for a fun and funky look, overstuffed and perfect for snuggling in front of the fire. 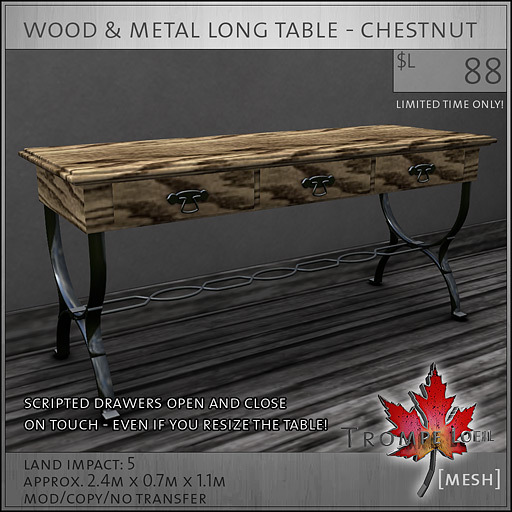 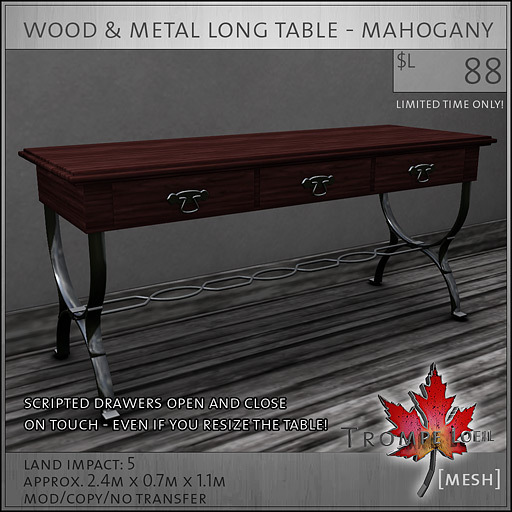 And finally, a slightly late entry to the C88 lineup, our new Wood and Metal Endtables! 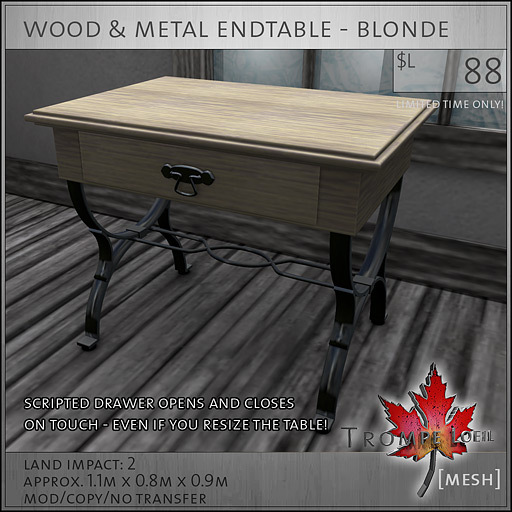 Available in five wood styles, this fashionable endtable features a working drawer that opens and closes on touch. 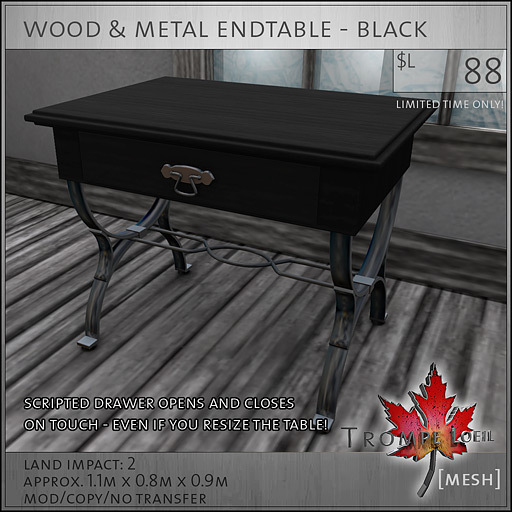 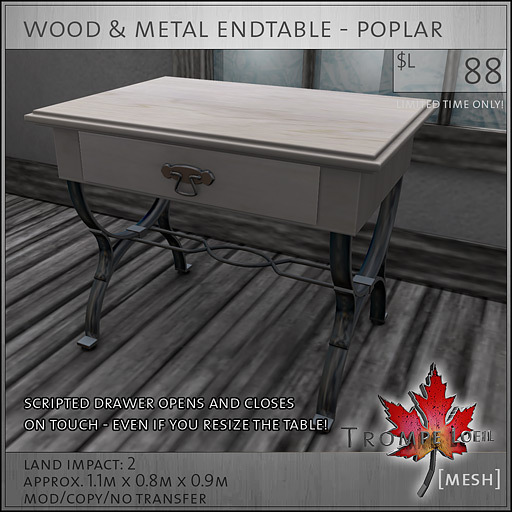 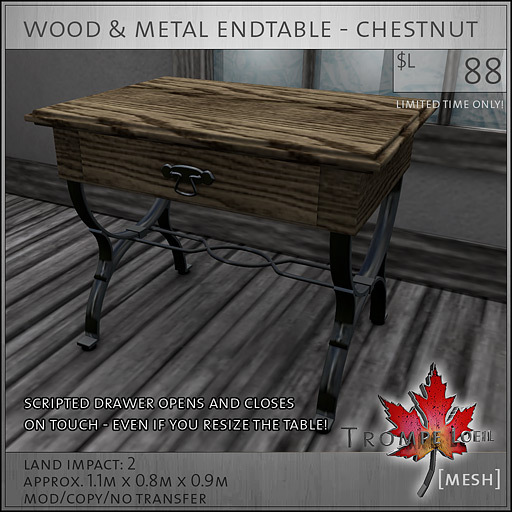 Plus, you can still resize the table – the drawer will still work!